Rescue crews, including Pennington County Deputy Sheriff Willie Whelchel, look over a map of the search area Saturday. ROCKERVILLE, S.D. 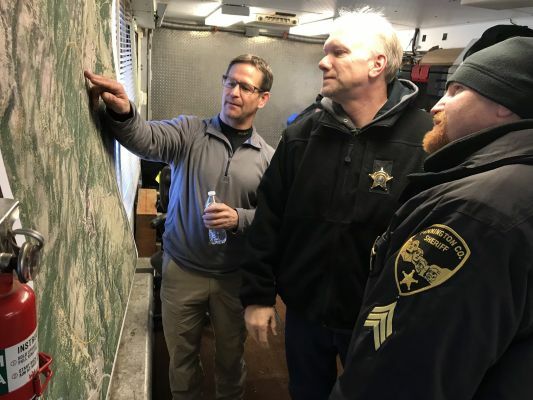 - Search and rescue crews wrapped up a full day of searching Saturday for Serenity Dennard -- with no sign of the missing 9-year-old to be found. Serenity has been missing since Sunday, and the search for her is dubbed as a recovery effort. That is assuming the little girl who ran away from the Black Hills Children's Home didn't find someplace warm or was picked up by someone. At 6:30 Saturday night, Pennington County authorities say they had wrapped things up for the day and would search again Sunday. Seven dog teams and a helicopter donated by Rushmore Helicopters and Mike Jacobs aided in the search. The cold weather continues to hamper the search. Dogs, like humans, must work in shifts and head back to base camp to warm up after being out in the cold. Two spotters from the Pennington County Sheriff's Office flew aboard the helicopter today, hoping to find any trace of Serenity. Pennington County Deputy Sheriff Willie Whelchel says the team will forge ahead tomorrow, despite the fact it's so cold. "It would be nice if it would warm up a little out here for all of our searchers and our dogs but we're forging forward."